Beautiful brown, quality colt weanling by Beckworth Rising Magic that is going to make a royal quality galloway. Dam is Dreamtime Tartini. For sale or lease to experienced show home. to approved or proven show homes. The sale prices of our horses is based on the right homes for them. We sometimes also have youngsters available to lease on breeders terms. We have several youngsters (yearlings & foals) as well as several broodmares in foal to Dreamtime Xzibit available for sale or lease. LOVELY CORRECT TB MARE IN FOAL TO XZIBIT. Paddock photo, nice tall mare with correct conformation. Only for sale as we are retaining her filly. Riding Pony mare in foal to Marconi Voodoo. 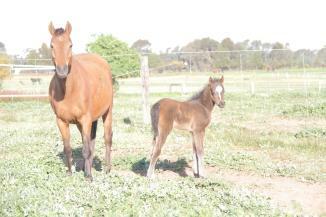 first foal by M. Voodoo is pictured. A super correct fellow with personality & exceptional conformation. 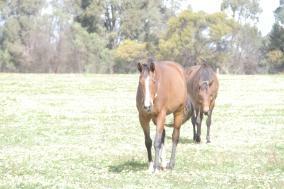 YEARLINGS FOR SALE only to make room for foals. Lovely mover, make super show horse. $2000.00 available now in paddock condition. $1400.00 now in paddock condition. Will make a very competitive show hunter at all levels with the right home. 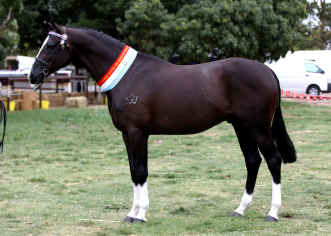 Dressage or show Galloway gelding. Movement to burn, very soft on the ground. Quality galloway. $1500.00 You will not find a better buy than this. Paddock condition at the moment. Price only valid until show prep commences.